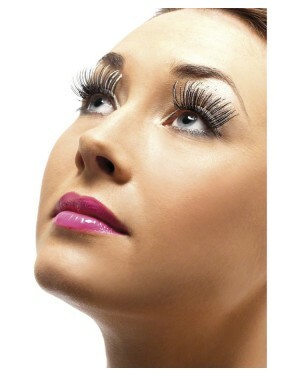 Bring instant glamour to your fancy dress look with a pair of False Eyelashes. All of our quality False Eyelashes come complete with everything you need - a pair of fake eyelashes plus a tube of quality adhesive - along with easy application and quality assurance from a trusted brand. With fun in mind you can choose from classic looks, bright colours and bold designs to complement a range of fancy dress themes! 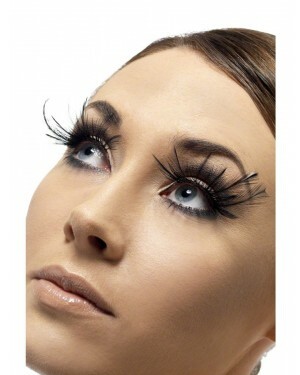 Starting at only £2.19 - Fake Eyelashes are the ideal way to add some extra impact to any fancy dress look. If you fancy trying out a pair of False Eyelashes but you don’t want to be too bold, why not go for a classic style with a pair of our black lashes. Or for a little bit of extra sparkle, we also have a range of classic black eyelashes with sparkling designs - with a range of diamante lashes, beaded tips and glitter designs to choose from. Or if you’re looking for something a little brighter why not go for one of our neon or feather False Eyelashes. Neon colours are perfect for 80s fancy dress and really add some extra impact. Our feather fake eyelashes also create some drama and look good for a 20s theme (a perfect match with a feather boa) or with a glamorous Burlesque Costume! If you’re used to False Eyelashes andwant to go for ultimate drama we also have some striking Fake Eyelashes with dramatic designs - from ultra-long lashes to dramatic feather plume designs!